The West Branch of the Sacandaga River is a nice stretch of water that is extremely popular. This stretch of flat water is approximately 8 miles in length and generally parallels NY Route 10 to the Shaker Place in Hamilton County. The launch site for this stream is where Route 10 crosses it just north of Arietta. Canoes can be launched on both sides of the stream,and limited parking is available. Going downstream,you’ll come to a point where the river bends to the left at a big pool. Look for a channel on the right side of the pool–just wide enough to get a canoe through–that leads to Chub Lake. Further downstream on the Upper West Branch,you’ll find Trout Lake,which can be reached via a channel entering the river. For an overnight trip,campsites are located along the three lakes. The Launch:The popular area to start your trip is a small bridge and small parking area. There is a lot of parking space and on weekends in the summer months you will find many cars here. 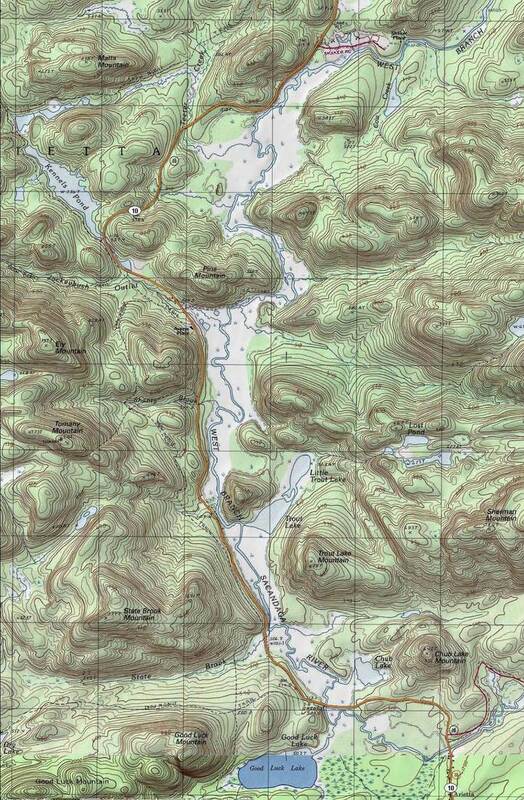 Description:The West Branch of the Sacandaga offers beautiful flat water paddling. The river travels through a broad valley of marshes lined by mountains. 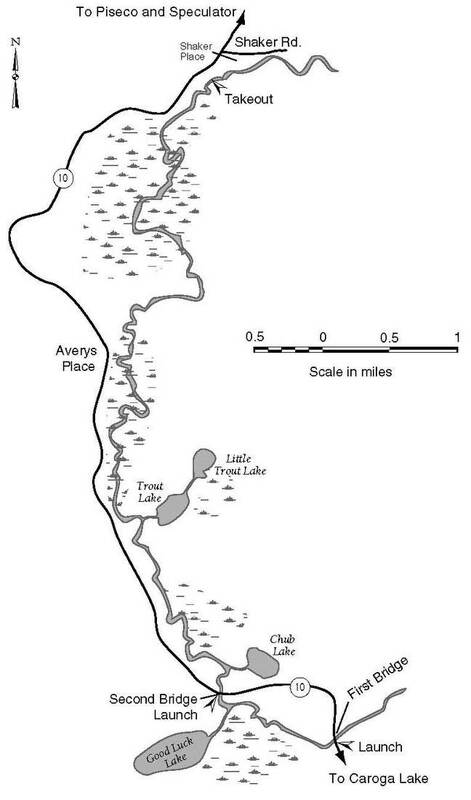 Trip distances will vary according to the number and length of side trips into Chub and Trout Lakes. The one-way route begins at the bridge and ends at a steep bank where NY 10 comes close to the stream. About 0.2 mi farther is an old Civil Conservation Corp camp dating from the 1930s known as Shaker Place. At present there is a locked chain-link fence blocking Shaker Road,so canoeists and kayakers can no longer use this area to exit the river. An interesting side trip is to paddle upstream to Good Luck Lake. The paddle is short. You will reach a fork in the river shortly after heading upstream. To reach Good Luck Lake,take the right fork. Downstream from the launch the river here is noticeably wider and deeper. Within a few minutes you will come across Chub Lake on the right. According to books on the subject,there is supposed to be a large rock on the lake where you can stop and rest or picnic. As you proceed down the river you will come to the outlet of Trout Lake approximately 2 miles from the bridge. Depending on the time of year and resident beaver activity,sometimes you are able to leave Trout Lake and enter Little Trout Lake. This is dependent on the water level. These coordinates (43.304668,-74.543574) locate the only good camping spot on the river, it’s about 6 miles in, and I’m not sure it is DEC approved. Good swimming there though. Takeout:Depending on the trip you choose,the takeout will be either back at the launch site or at a steep bank on river left where the stream comes close to NY 10 prior to the Shaker Place. There is a rough trail up the bank where others have lifted their canoes or kayaks to the road. A few cars can be parked beside the road in a narrow pullout area. The cars can be seen easily from the river. By car it is 6.0 mi on NY 10 from the second bridge to the takeout.